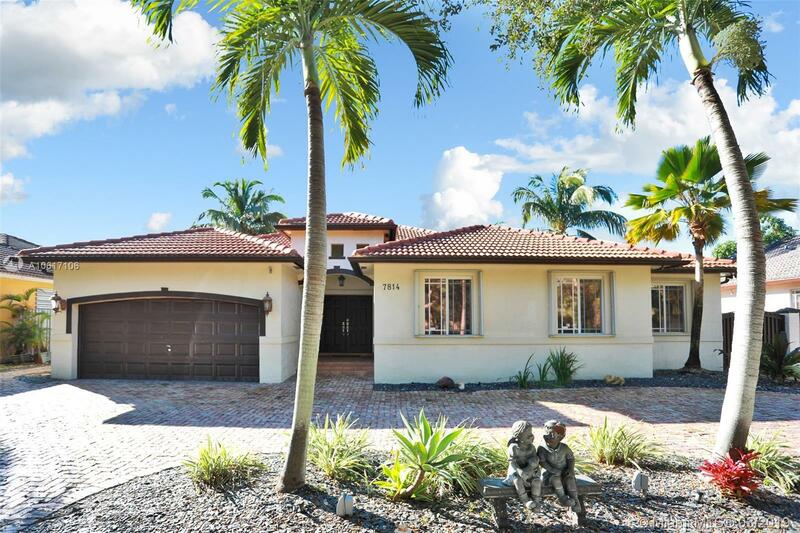 Remarkable one story home located in the desirable City of Miami Lakes guard gated community. It features 4 bedrooms, 2.5 baths, plus den, office, or playroom, two car garage and a pool; formal living and dining areas; open kitchen/family perfect for entertaining; paved circular driveway; split floor plan; tile throughout; master bedroom with his & her closets, dual sinks, tub and shower combination; alarm system; accordion hurricane shutters; camera system; tankless water heater and salt water pool system with new diamond brite resurfacing. Patio is a beautiful private oasis ready to relax or entertain with a built in Bar/kitchen area. Walking distance to excellent school and community parks. This home is ready for a growing family or if you want to downsize but love to entertain.